Details of the consultation can be found on the European Chemical Agency (ECHA) website. To access the submission form, click on ‘Give comments’. The Vintage Arms Association was formed in 1973 to promote the shooting and collecting of all vintage firearms, (designed or in production before 1945). Many of these firearms are muzzle loading, or early breech loading, which can only be loaded with pure lead balls or bullets. 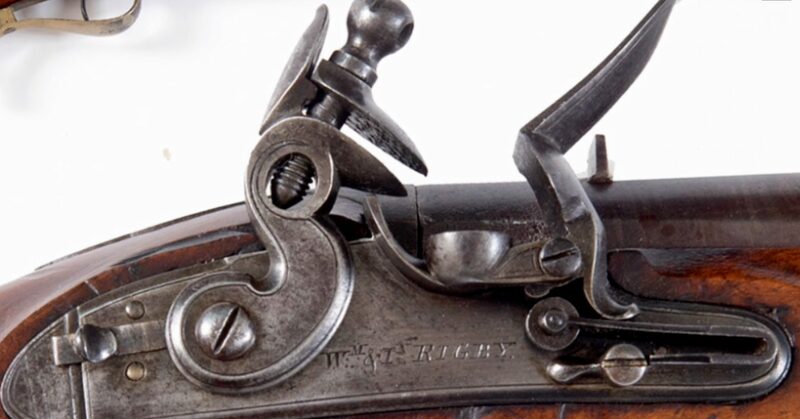 The principle, dating to the 1840s, depends on the bullet expanding in the barrel, to engage the rifling. Only pure lead can achieve this. Many of the later rifles have a rifling twist that is designed for lead-filled, jacketed bullets, of a certain density range. They will not be accurate when firing bullets under this density range. There are consequently no practical alternatives to pure lead, or jacketed lead, for use in these vintage firearms. It should be recorded that the lead bullets fired into the backstops of rifle ranges are regularly removed, melted down and recycled, so there is very little residual lead on rifle ranges, whether they are situated in ‘wetlands, or not. These bullets lodge themselves deep in the sand of the backstop, so they are not available to birds, or other wildlife, before they are dug out and removed. Most vintage shotguns have Damascus steel barrels, which can only be used with lead shot, propelled by black powder charges. Alternatives are too abrasive and would quickly ruin the barrels of these expensive, vintage and antique guns. The use of plastic wads, which shroud the shot and provide some protection for the barrel, are prohibited in most wetlands in the UK, on environmental grounds. Because of the low density of steel shot, it is necessary to use higher velocity, magnum cartridges, which can only be fired in modern shotguns, proofed for these higher pressures. The abrasive nature of steel shot quickly destroys the barrels of these modern guns, so they are designed for easy barrel replacement, which eliminates the cost of replacing the entire shotgun. This is obviously not the case with antique and vintage shotguns, which have a far higher value than some modern shotguns, due to their rarity. Their continued existence is due to the care with which they are looked after by their owners, who wish to preserve them for future generations, as they are part of our national heritage. This care includes the use of suitable ammunition, which is traditionally lead. Despite the use of lead since the origin of hand-held firearms in the 14th Century, there is no instance, to my knowledge, of a human death caused by ingestion of lead shot from an animal or bird. Due to the unsuitable nature of non-lead shot, an exemption should be given for antique and vintage firearms and shotguns. An exemption for approved rifle ranges and clay-shooting grounds would be an acceptable alternative, as these areas do not pose a danger to either wildlife or groundwater. In Scotland, ‘wetlands’ are already defined by the RAMSAR definition. This is similar in Northern Ireland, where ‘wetlands’ also cover peat marshes and temporarily flooded areas. In England, lead shot cannot be used in the area below the foreshore and areas of Special Scientific Interest. In all cases, the lead prohibition relates to shot fired from shotguns, not to bullets from rifles or pellets from air guns, as these are either insignificant in quantity, or do not remain in the environment. In England & Wales, the problem of defining ‘wetlands’ was tackled by targeting the relevant gamebirds, not the specific area where they could not be shot with lead. Consequently, geese, ducks, moorhen and coots cannot be shot with lead shot. This makes enforcement much easier, as the shooter cannot claim that the bird was not shot in a ‘wetland’. If the bird contains lead shot, this is sufficient evidence to prosecute. In the majority of cases, these birds are shot over wetlands, so in effect, the area is defined by where birds that are susceptible to lead are actually found, (and shot), as opposed to where they theoretically should be. In Scotland, the area where lead shot cannot be used is defined by Ramsar. In this case, it would be necessary to enforce the restrictions in the field, which is impractical over such a large area. In the UK, lead-free shot is available, mostly steel and bismuth. Steel shot is 2-3 times more expensive than lead shot but is nowhere near as effective. There is a huge risk of wounding birds if they are not shot at close range. The alternative is to use high velocity cartridges, which usually require the purchase of a new shotgun that is proofed to handle these cartridges. 10 gauge cartridges are more effective than 12 gauge but are more expensive. Bismuth is more similar in effect to lead but is 4-times the price. Tungsten, Nickle, soft iron is slightly more-dense than lead and just as effective but is 5-7 times the price. Many steel cartridges use plastic wads, to protect the barrel. These wads are a hazard to the environment and not really suitable in ‘wetlands’. The use of acceptable fibre wads can double the price of these ‘non-toxic’ cartridges. The assumed intention of the proposal is that only the rich should be able to shoot wildfowl. It would not be feasible to use lead-free shot in any vintage or antique shotgun. Even the alternative that are similar to lead are more abrasive and would quickly wear out the barrels. It would be necessary to obtain, and regularly replace, a new shotgun in all cases, if a total lead ban is adopted. This will require a considerable amount of practice, to get used to both a new gun and the different characteristics of the lead-free ammunition. The result of this will be a huge increase in the number of wounded birds, until shooters become acquainted with new guns and ammunition. This is not acceptable, as the increased suffering to wildfowl will be disproportionate to the effects of lead. All shooting ranges used by the Vintage Arms Association have the backstops regularly combed out and the lead bullets removed for recycling. A record is kept of the number and type of bullets fired, to estimate the weight of lead fired into the backstop. The recovered lead is weighed to estimate the percentage of lead recovered. The residual lead is minimal and not available for ingestion by wildlife. As much of the lead ammunition is copper-jacketed, the lead is not exposed to contaminate ground water. Current legislation does not cover rifle ranges at clay shooting grounds, as no wildlife is shot on these ranges and they are not within range of areas frequented by waterfowl. Wildfowl hunting is seasonal, with specific periods when certain wildfowl can be shot. Reducing the transitional period to 18 months could mean only one shooting season, depending on when the period starts. This eliminates the ability for comparison within the transitional period. The transitional period should therefore be considered in terms of shooting seasons, not months. If the proposed intention is to cover three shooting seasons, then specific dates should be agreed to include three shooting seasons, otherwise several months of the transitional period would not actually apply.